Promixon, Magnago (MI), Italy, recently delivered a giant hot/cold mixing combination to a major US manufacturer of luxury vinyl tiles (LVT) which are widely used for flooring. 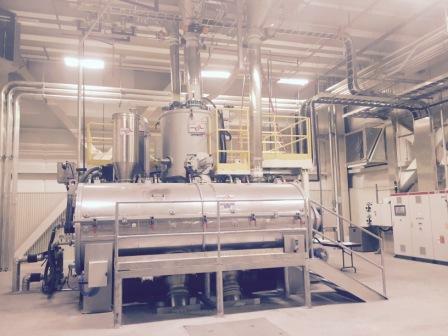 The XBLEND-MC/2500/8600 consists of the high-speed heating mixer model XM-2500 combined with the XC-8600 high-efficiency horizontal cooler. Designed to operate 8500 hours per year, this huge mixing system weighs nearly 12,000kg and has been customised to process a wide range of formulations, with special attention given to minimising mixing times and optimising energy consumption. It is capable of producing 1200kg/batches of PVC dry blend at a rate of eight batches per hour, with an hourly output of 9600kg. The cooler has been specially engineered to receive up to 1500kg of CaCo3 filler with each batch, mixing it with the dry blend during cooling. Copyright © 2015 Oakhill Media Ltd. All rights reserved.